Stephen Welt is an Elite Certified USPTA professional who hails from London, England. His previous work experience includes time with the Weymouth Club (Boston), the EvertTennis Academy, Mission Hills Country Club (ClubCorp), the Yakima Tennis Club, and the Bay Oaks Country Club. He has served in a Tennis Director role for the past 10 years and has experience serving as General Manager. Stephen has expertise in teaching both beginner and high performance tennis, organizing fun events and running both in house and USTA sanctioned tournaments. He brings a wealth of knowledge in programming, on-court teaching, and management. Sean Kelly a Puget Sound native played his junior and High School tennis in Edmonds, Washington. In 1998 Sean joined the United States Professional Tennis Association and was certified at the Professional level. Sean began his career as a Tennis Professional at The Forrest Crest Athletic Club. During which time, Sean coached Inglemoor High School, guiding one of his players to become the state singles champion. Sean was named high school coach of the year by the Seattle Times in 2006. Sean moved on to coach tennis at Busch School in Seattle and continued to have success guiding players to the state level. In 2005 Sean became a Tennis professional at Edgebrook Club and has been a key influence in revitalizing the junior program as Co-Director of junior tennis. Sean sincerely enjoys his students and has a great affinity for all the club members that he has had the privilege to interact with. Nate Geigle - From 2014-2016 served as tennis coach at Division II Chestnut Hill College. During 2015-2016 season, garnered Men’s Tennis CACC Conference Coach of the Year and coached freshman Pierre Kohler to a men’s ITA East Region Rookie of the Year award and senior Iman Williams-Mulesa to the women’s ITA National Most Improved Player award. 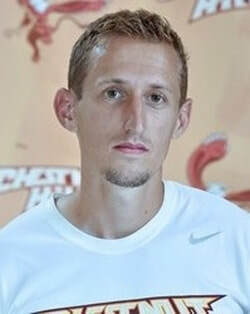 Following graduation from Davidson College in 2010, Geigle was a collegiate athlete and assistant coach at West Chester University, where he played number one singles and number one doubles. Geigle had a standout high school career at Archmere Academy, where he reached the Delaware state singles finals and served as team captain in his senior year. He also has teaching experience as a summer instructor at the Wildcat Tennis Camps in Davidson, NC and at the High Performance Tennis Academy (HPTA) in Bala Cynwyd, PA.